The Martin 167-A3 is a Rank I French frontline with a battle rating of 2.3 (AB/RB/SB). It was introduced in Update 1.77 "Advancing Storm". ? ? 9 600 ??.? ??.? ??.? ??.? ??? ? ? 9 600 ??.? ??.? ?.? ?.? ? 574 278 ??? ~?? ~? The four machine guns are arranged in bundles of two mounted in each wing. Each are armed with the same amount of ammunition, which means that all guns will fire with each other until empty. Immediately on spawn, drop all bombs, hit WEP and climb. As WEP runs out, level the plane and wait for the next WEP cycle. It takes about three WEP cycles to get to a decent altitude. Remember, as you are climbing, release bombs as they reload to reduce weight. Once you are at a decent altitude, fly towards your targets and prepare to bomb utilizing the bomb sight (V). If you start to see fighters working their way up towards you, continue on climbing in between bomb reloading cycles. Repeat 4-5 as needed until you get shot down or the game ends. Mid-Low altitude bomber: At the mid-low altitudes you are a prime target for fighters, being not as manoeuverable and a fairly large profile. Here you may only get one chance to drop your bombs before being shot down, so look for holes in the enemy defense where you can slip by, line up a shot, drop your ordinance and manouever out for another run (or reload at base if playing RB/SB). If pressed and there are enemy all around, turn into heavy-fighter mode after your ordinance has been dropped and start pursuing. The turn and loop time is not the greatest, however this aircraft has a strong rudder and can do a power-on wing-over, quickly changing directions without much loss in energy (and a surprise to some pursuit aircraft who think they have you nailed). At this point, you can also transition to attacker mode. 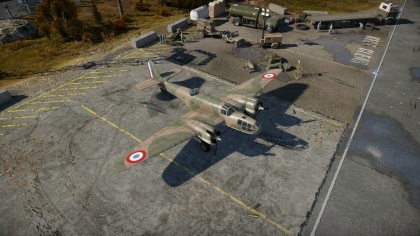 Attacker (on the deck): While the four wing mounted 7.5 mm FN Browning machine guns may not seem like much, when coupled with the 50 kg bombs, you can rack up some vehicle kills. While strafing the ground, all soft targets are available as the vehicles will not have much time to get out of the way of your ordinance. 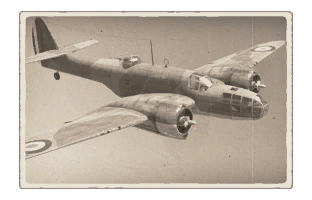 In AB it is best to use your 3rd person view to use the bombing indicator as you will need to fly the aircraft and bomb at the same time (vs. using (V) and solely utilizing the bomb sight while the AI keeps the aircraft level). In between bombing reloads you can strafe with your 4 x 7.5 mm machine guns to eliminate artillery/AA gun emplacements and armoured vehicles. While on the deck, you will typically encounter enemy aircraft and can divert to go after them if given the chance or perform evasive maneuvers while your gunner fires away (you get credit for hits, so let him fire away!). Decently manoeuverable for a bomber. Short take off distance (which is great for maps with short runways). Tracer belts for the forward-firing MGs are flamethrowers. Good visibility from the cockpit. Decent rate of climb at full load (best when ordinance is released). Strong rudder control - aids in sharper manoeuvers. Rear gunner field of vision and fire is small. Rear gun is on a pintle mount, and cannot traverse forward. Extremely prone to fuel fires. (RB/SB) Flaps tear off quickly and at moderate speed (easily red-lines in a dive). The Martin Model 167 medium bomber was developed as a response to a set of requirements issued by the USAAC in 1938. Following these requirements, Martin developed its Model 167 bomber, which received its official testing designation of XA-22. However, despite showing favorable performance, the XA-22 lost out to the Douglas DB-7 (which became A-20 Havoc) during the competition, which resulted in Douglas getting the contract with the USAAC. What would usually spell disaster for most projects that suffered a fate like this, turned out to not to be the case for Martin’s design. With an armed conflict looming over Europe, nations such as France and the UK were desperately stocking up with any military equipment that was on offer, including aircraft. France in particular was looking into buying any available aircraft from manufacturers abroad as the domestic production was limited. These manufacturers were in many cases American companies, just like Martin. In any case, the first orders for French export versions of Martin’s new bomber soon came in, effectively sparing the project from ruin. The first order called for more than 200 Martin 167s to be built with certain modifications made to optimize it for French use, such as the installation of French armament, including guns, metric instruments and different engines. Martin, eager to fulfill the order, nearly doubled production and managed to manufacture over 100 aircraft in the space of six months. However, the shipment of ready units was delayed until October 1939 until the U.S. arms embargo was lifted. During this period, the French placed an order for an additional 100 aircraft to be made. However, before the order could be entirely fulfilled, France had been occupied by Germany in June 1940 and only 25 further aircraft made it to France after the initial batch. Nonetheless, the units that made it to France performed well in combat, out matching some of France’s domestic bomber aircraft, such as the LeO 451 in combat efficiency and loss rates. Once the armistice was signed, the remaining aircraft were transferred to the African theater of operations, placed under Vichy command and took part in bombing missions against allied positions. In 1943, the Martin 167s stationed in Africa were replaced by newer allied aircraft once the local French forces joined the allies again. A total of around 450 Martin 167 bombers were manufactured and the aircraft continued to serve among the ranks of the French and British air forces until 1945. This page was last edited on 9 March 2019, at 17:57.